We offer our clients a comprehensive variety of Parker OSPE.B Belt Driven Linear Actuator which offers a cost effective solutions aimed at small to medium industrial applications that calls for high speeds and long travels. The OSPE.B comes in a standard range with a core slider bearing guide. It belongs to the Origa System Plus family, reputed for efficient delivery of premium quality and cost effective ownership. Clients can now enjoy the efficient services offered by Parker Electric Cylinders. 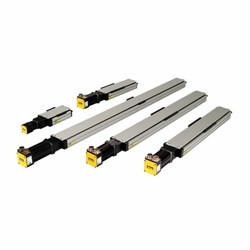 The Parker ET Series Electric Cylinders is an amalgamation of brilliant design with wide ranging feature selections allowing it be out to use for both new and existing applications.These products offered by us are manufactured as per hard metric ISO standards, the ET Series can be placed into current fluid power cylinder applications. This result in unlimited programmability to the durability and long life expected of hydraulic and pneumatic cylinders. 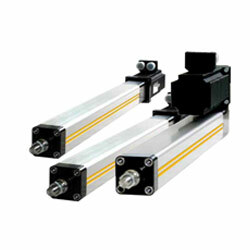 Facilitated with Parker Hannifin motor and control system, the ET Series is one of the best electric cylinders to serve the critical specifications of clients. Multi-Axis Connection System - simplifies engineering and installation We are introducing our clients to the perfection of Parker Multi-Axis Connection System which is a versatile system for connection of linear drives in multi-axis arrangements. With highly adaptable range of adapter plates, profile mountings and intermediate drive shafts simplify engineering and installation. Suitable for the heavy duty belt drive series OSP-E BHD, the system offers cross-connection with the same series and also other linear drive series in the ORIGA SYSTEM PLUS range. 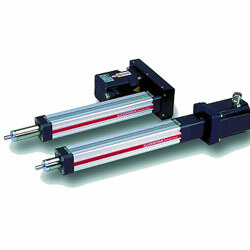 Delivers integrated customized solutions for motion control requirements. From one location, Parker manufactures 3 core technologies: gearheads and gear motors, linear positioning systems, and servo motors and amps. This provides our engineers with the ideal ability to integrate precision products and components into one complete, turnkey motion control system. before it leaves the facility. The range combine linear and rotary motion, servo motors and amps, precision gearing, and motion controllers into high performance, automated "drop-in" solutions that fit seamlessly within client application, saving time, trouble and effort. Parker systems pack a tremendous amount of performance into "small footprint" designs, making it possible for companies to improve yield and increase throughput with smaller equipment and facilities. We facilitate our clients with the superb engineering skill of Parker Hannifin who have been delivering groundbreaking automation solutions for decades. The same efficiency is to be found within the exploding market of linear motor technology. 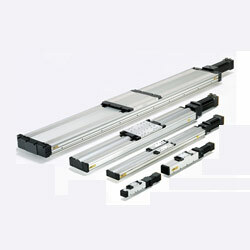 Parker Linear Motor solutions are reputed for brilliant automation and robotics. It results in customer's distinct performance enhancements and cost of ownership benefits over competing technologies. 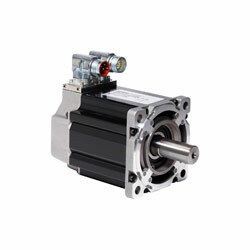 A linear motor functions in precisely the same method as a rotary motor that has been "unwrapped." The same electromagnetic effects that produce torque in a rotary motor now produce a direct force in a linear motor. For many applications, linear motors offer distinct advantages over conventional rotary drive systems. For example, there is no need to couple the motor to the load by means of intermediate mechanical components such as gears, ball screws, or belt drives. The Parker Linear actuator with ball screw that we bring for our clients is a perfect combination of adaptability and rugged construction in a solid motion stand that is ideal for continuous process automation. A brilliant ball screw drive, recirculating square rail bearings and high strength aluminum body diminishes costs while scaling performance. 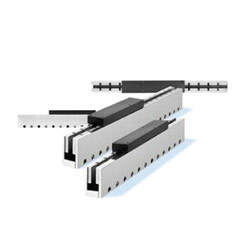 The 400XR Precision Linear Tables is reputed for accurate arrangement, consistent performance, rugged features and adaptability. Fine performance, modular compatibility, and fast delivery have made these tables the perfect building blocks for cost-effective multi-axis systems. 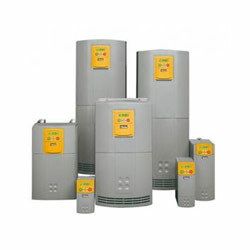 Modular flexibility sets this range apart distinguishes from all others permitting easy configuration to meet unique requirements from the very basic to the highly complex. We offer Parker Precision System to meet the need for greater heat dissipation in high ambient environments. Parker offers Two-Phase Evaporative Liquid Cooling is "mission-critical". The range has standard containers for grid energy storage for wind and solar farms, constructed as per customer requirements for infield battery and power conversion. Perfect for industrial , renewable energy and even data center applications, Parker's patented 2-phase "evaporative" precision cooling systems can upsurge the power output for high power systems by up to 40%. Further, the competent cooling system can escalate electronics density by 2X or more, or simply reduce existing packaging size. Parker's two-phase evaporative cooling system uses a refrigerant that is non-corrosive and nonconductive to cool electronics in a closed-loop, highly efficient system that is fully modular, as well as lighter, safer and more reliable than traditional thermal systems. The system uses a small pump to deliver just enough coolant to the evaporator -usually a series of one or more cold plates optimized to acquire the heat from the device being cooled. The two-phase coolant vaporizes to maintain a cool uniform temperature on the surface of the device. The vaporized coolant is pumped to a heat exchanger, where it rejects heat to the ambient, and condenses back into a liquid, completing the cycle. Our range of Parker SSD Drives servo products that we directly source from Parker covers extensive variety of power ranges and applications, Parker servo products include application development and configuration software, as well as industry standard bus communication protocols. Suitable for the most challenging servo systems, the ultra-fast control loops and process bus make the Parker servo drive perfect for single or multi axis applications. Printing machinery (shiftless)) high performance test equipment, multi-axis, torque motor control, very high power applications. We source from Parkers the world renowned variety of Parker Servo Stepper Motor that is available in electric, hydraulic and pneumatic technologies in varied range of sizes and configuration including rotary and linear. 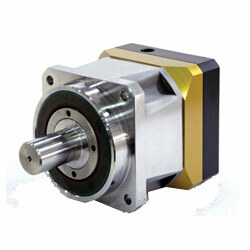 The Parker Servo Stepper Motor finds application in unimaginable variety of requirements ranging from miniature brushless motors to high power hydraulic motors used in earth moving equipment. Parker motor systems are designed to meet almost any motion control need, and help one to select standard products or provide rapid design integration solutions. The comprehensive range of Parker Motorized Positioning System offered by us carries the competence of the world renowned Parkers. 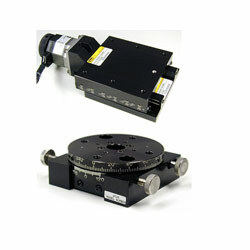 This perfect fit" electromechanical device offers solutions for top of the range positioning and high-speed automation. Parker-Daedal presents a comprehensive range of linear and rotary, manual and motorized positioning tables. 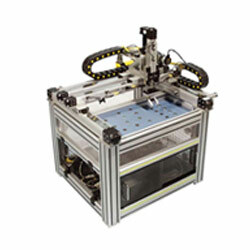 These offer hundreds of standard products but also have the engineering resources to custom design and build unique positioning systems. Positioning technology comprises belt drives, ball bearings, precision ground and rolled thread ball screws, cross roller bearings, precision ground lead screws, rotary bearings, precision ground and lapped worm gears. We offer a very efficient range of Planetary Gearhead that is enriched with high torque capacity per unit weight and volume as well as low backlash and high stiffness. We source the range from world's most renowned manufacturer of the product. We bring planetary gearheads in a variety of sizes in inch-series diameter codes from Size 8 to Size 80 (.8" to 8") corresponding with our standard servo motors. We equip these units as complete vehicle level line-replaceable units (LRUs), including hinge lines, as required by the overall system design philosophy. Our planetary gearhead features high torque capacity per unit weight and volume, as well as low backlash and high stiffness. The output bearing pair span in our planetary gearhead architecture provides maximum radial stiffness against the mating forces of the payload.